Special discounts and benefits are available to current AAM members. Contact HQ for details. Learn more about the conference, view the agenda and register today. Since 2014, AAM has been a sponsor of the Winning is Everything conference. Put on by The Advisory Board, this conference is focused on bringing top-level information and ideas to CPA firm leaders including managing/senior partners, CEOs, COOs, marketing executives, business developers, firm administrators and all members of a firm’s leadership team. We are excited that marketers and business developers are part of firm leadership this conference is aimed at serving and are proud to be a part of this great event. 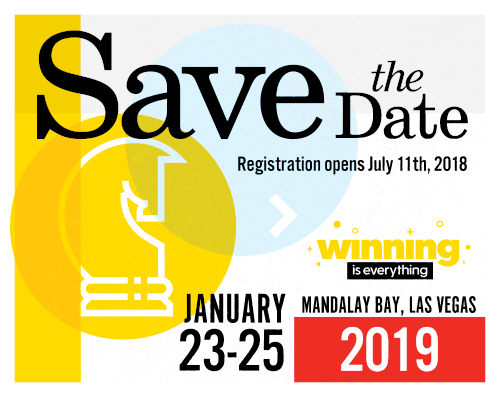 In addition to specific content developed with marketers and business developers in mind, attendees experience WiE’s impressive general sessions and can choose to attend any of the conference’s other educational tracks.